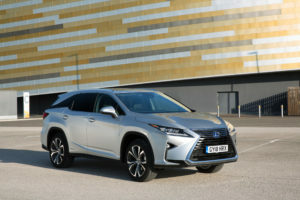 Lexus breaks new ground this week with official sales launch of the new RX 450hL, its first seven-seat model in the UK. Designed to extend the appeal of the RX luxury SUV, the new RX L provides an extra two seats with, according to Lexus, no compromise in the comfort of all passengers on board. It shares the same hybrid powertrain as the five-seat RX, but benefits from a revised body extended from the rear axle to ensure the additional seats offer good head and leg-room and are easy to access. Comfort and convenience are further addressed by a power-folding system for the third row seats and triple-zone climate control being provided as standard on all versions of the RX L.
All versions of the new RX L can be specified with a Protection Pack, which provides rubber floor mats, a bumper protection plate, boot liner and mud flaps. The Premier grade model can be fitted with a Style Pack, adding a front skirt, rear bumper protection plate, chrome side sills and alloy wheels with black inserts. A sunroof is available for the Luxury model. The RX L is on sale now, prices are shown in the table below.